Please give me a moment; I think I’m still in shock. I just paid $24,666.06 to close out my CitiAssist Loan and subsidized HBS loan. Combined, the two loans started out at $25,000, payable over 15 years at a monthly payment of $186. I’ve been making payments for over 21 months, but managed to chip away at only $334 of principal during that time. If I had gone full-term with the loans, I would have paid $8,480 in interest. Paying off the $25k was easy–I used money that was just sitting around. The remaining $65k is going to be the challenge, as my liquid assets are basically depleted. Tonight I have pedi-cab training at 9 PM, and hopefully the roommate interview is still on for 7:30 PM–she still hasn’t confirmed. I don’t think it’s hit me yet that my life savings of $30k are almost completely wiped out. Wow! Congrats on the pay off! I have been following your blog and its truly inspiring. 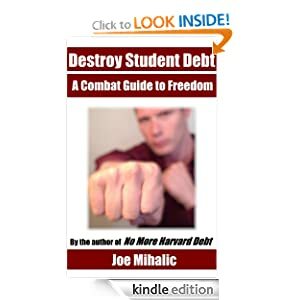 I had $25k in student loans (down to $19k now..) and I am always looking for way to get rid of that burden. Thanks for the ideas and your updated progress. I also enjoy reading about your adventures in Austin.. I’m about 4 hours south of you. Anyways, congrats again! Keep plugging away at it, Kelley. Good luck. Awesome job!! Just to be sure, did you get the payoff amount from the lenders? That can be more than the amount due on the website. Just make sure that you get that if you haven’t because you wouldn’t want to think you paid off your loan and then default for like $15 in interest. In any case, that is amazing! Keep up the good work!! Nancy, good call. I did in fact get the payoff amount from the lenders, but yeah, that would have been horrible. If you have a $22,500 car, according to my 1/10th rule, you’re making around $225,000 a year in gross income right? If so, isn’t that good enough to slowly chip away at your school loan? That just went way over my head. You have rules? Are you a game master? This free sharing of inrfomaiton seems too good to be true. Like communism.